Cara Miller of Las Animas was chosen as the 12th annual Andrew Ricken Memorial Scholarship winner. 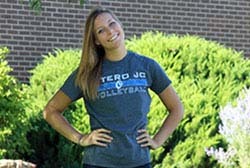 The scholarship will cover 6 credit hours of tuition at Otero Junior College, where Miller studies business and plays volleyball for the Rattlers. Miller, a graduate of Las Animas High School, is the daughter of Rick Miller and Michelle Clinton. Grandparents are Irl and Hazel Miller and Kenneth and Carol McEndree. Miller will be officially honored as the 12th annual Andrew Ricken Memorial Scholarship winner on July 29 at the Bent County Fair Car Show in Las Animas. Andrew Ricken attended Las Animas schools from kindergarten through graduation in 2001. He was an active member of Future Farmers of America (FFA) and his church youth group. A founding member of Muscle Cars Unlimited and a member of Christian Motor Club, Ricken loved working on vehicles and going to shows. He had aspirations to attend Wyoming Tech after working to save money to pay for his tuition. Ricken was killed in a car wreck on August 20, 2001. His family, as well as members of Wheels Ablaze Muscle Car Ministry, have established a memorial scholarship fund to honor at least one area graduate each year. “We feel he would have wanted us to help other young students reach their dreams in life and help pave their road to success,” said Doug and Missy Ricken, Andrew’s parents. The 2017 Andrew Ricken Memorial Scholarship winner is Cara Miller. Miller is pursuing an associate degree at Otero Junior College, with the ultimate goal of attaining a Master’s of Business Administration degree.